"Excellent as a side dish or use on steaks or chicken as a sauce. Flavored with butter and dry ranch mix, these are just too easy for as good as they are. Any mushroom will work but Portabellas are outstanding"
Melt the butter over low heat. Mix in dry ranch salad dressing mix. Add mushrooms, and stir to coat. Cook, stirring frequently, until the mushrooms are very tender, at least 30 minutes. 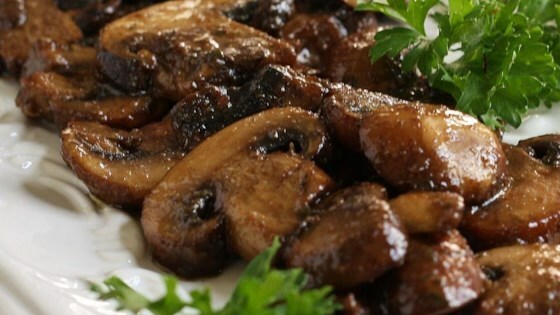 Mushrooms sauteed with red wine, teriyaki sauce and garlic. I used only half the butter and half the ranch mix, and they were still the best mushrooms ever! These are very tasty! They go great as a side to almost anything. Do NOT get too heavy-handed with the ranch dressing powder though, as it is very pungent..
Yum! Husband thought they were great! I needed to use up a lot of near expiration mushrooms so I cooked and froze them. It was great! Tasted like ti was from a gourmet restaurant, especially with carbent sauvignon!